This project was produced by the history group in 2009/2010. Some content is also contributed to the National Archives Your Archives as part of their Historical Streets Project. This project is now discontinued. Church Path is the old path from the parish church of St Leonard in Upper Deal, County of Kent, through Middle Deal to Lower Deal and the sea over a mile away. Famous for The Downs and shipping in the age of sail during 16th to 19th centuries. It possesses a complete range of dwellings, high status to small cottages. It has an upper section, near the Church, a middle section (suject of this study) and a lower section. A typical view looking at the upper section towards the Church is shown in this photo (1890-1910) from the National Monuments Record where it is labelled Church Walk. It is still a path with housing on the western side fronting it. Parallel to it is Middle Deal Road with the rear entrances to these buildings. There are two short sections with road and post 1880 housing on the eastern side of these sections. There are clues to the early history of this path. In 1668 a Strangers Burial Ground was purchased by the parishoners near the current day St Andrew's Church. There was a query over its use in October 1794 (St Leonard's Church Vestry Minutes) and this refers to the earlier date. Church Path goes to it, so we infer that it was in use at that time. It is wide enough for coffin bearers and a coffin. Shown on the 1769 Andrews & Drury Map of East Kent. Had a nickname of Coffin Path due to the coffins taken up to the Church and down again. A Chapel of Ease (St Georges Church) in Lower Deal was only opened in 1716. In December 1794 a Vestry meeting was convened to purchase a piece of ground from William Pope for an overflow churchyard adjoining to Stone Lane of size 140 perches. This is located near the top end of Church Path today and so we have discovered a new 'official' name for Church Path. In 1818 an extension of the Dover-Deal Turnpike was authorised by Act of Parliament from Deal (Queen Street) to Sandwich. This is now named London Road. From Queen Street it went parallel to Church Path but on the eastern side, joining and appropriating an existing path (from Upper Deal direct to Deal Castle) and bisecting Church Path close to Upper Deal, joining the existing road through Upper Deal, out through Sholden and then across the marsh West of Deal through Hacklinge and on to Sandwich. At the crossing of Church Path, 'The Magnet Inn' and 222 London Road (Vine House) are aligned square on to Church Path and so are considered older than the Turnpike. The 1851 Census records some properties (HO 107/1631/27), notably the 'Fiver Ringers' and 'Bowling Green' pubs with their address as Gravel Walk so this name was in use for some period. On the 1st edition OS map (1873 revision) it is named Church Walk. Before 1898 it gains its modern name of Church Path (see Deal, Walmer & Sandwich Street Directory by Pain). 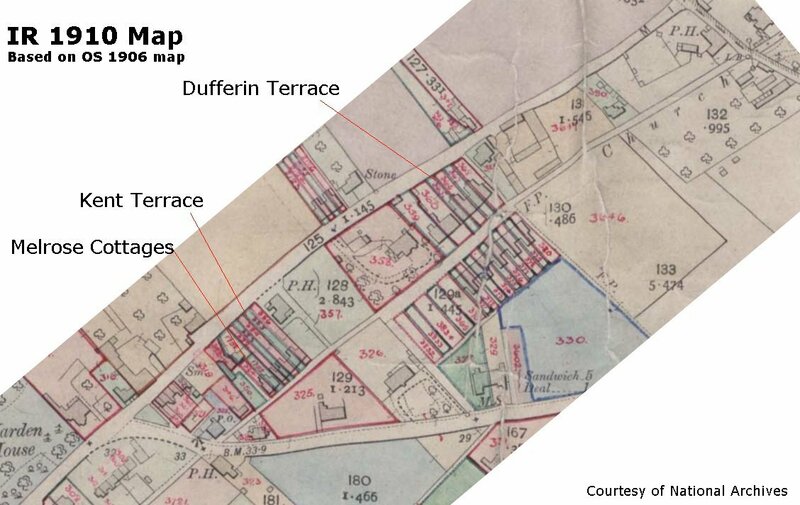 Street numbering for Church Path took place somewhat after the 1911 Census but before the 1910 valuation survey Field Books were filled in, in this case around 1914. The numbering has remained intact and has not gone through the process of re-numbering. It is interesting to note that Church Path runs parallel to the edge of the field boundary pattern shown on the 1843 tithe map and it does not take the shortest route to the sea. This implies that it came after the field boundary system. Indeed Church Path is heading towards the Ancient Highway being the original route to Sandwich over the Sand Hills. The second interesting note is that even the oldest houses are all aligned with their fronts to Church Path. The rear entrances back onto Middle Deal Road and give access to the stables, outbuildings, workshops etc. Also at the rear we have the Blacksmith and the farm entrances. Upper Deal is situated on chalk (the North Downs) at the base of the dip slope. Church Path runs in a north easterly direction over thick sediment and former marsh all at sea level. Deal itself is built on a shingle bank a great fosse, a spit that grew northwards from the cliffs at Kingsdown stretching some four miles to the mouth of the River Stour close to Sandwich. The chalk aquefer provides extremely pure drinking water and many wells were sunk in the area. The low lying land is very fertile. Henry J Harvey, Blacksmith was owner / occupier of Devonport House (using the 1910 IR survey) and worked in the Forge at the bottom of the garden, which fronted onto Middle Deal Road. He was still there as blacksmith in 1938 (Street Directory).